Please welcome author Beckie Weinheimer! First, congratulations on having Converting Kate being chosen as one of ALA’s 2008 Best Books for Young Adults. That’s fantastic! How did you react when you heard the news? I was busy writing something else and noticed a congratulations email from a friend in Virginia in my email in box when I took a break. I could not believe it. I clicked on the link she provided three times and then printed it out to make sure I was really on the list! Then my editor emailed to congratulate me and I guess then I started to believe it really had happened. In Converting Kate, I noticed that you seem to use the setting of Maine in two ways. First, it’s a little dark and gloomy, but this is where Kate finds a lightness and happiness with her journey of discovery. Does setting play an important role in the novel? That is such a good question. Since finishing Kate, and working on three other novels right now, I have realized that setting to me is almost as important as my main character. It is very important for me to be in love with the setting. Maine can have clouds which may make it appear gloomy, but they go away and people from Maine are known to say, if you don’t like the weather, just wait it will change. And I guess I felt that fit with Kate’s moods. Also she had moved from the desert, and although it is very sunny in Arizona, it is also brown and Maine, at least in early September, is green, vibrant and flowers are in blown everywhere. It feels so alive! And then with the ocean, instead of sand, and brown, well I felt that this setting, with the contrast from Phoenix (where I spent my own high school years) would cheer her up. I vacation to Maine every summer and the beauty of that place always moves me. The first time I went to Maine was the summer my oldest daughter died. I was very sad and very low, but somehow the scent of the pines, the beauty of the ocean, the ever changing clouds, all brought me peace. Kate’s mom, a very conservative woman, is such a strong character. How did you form her to be so realistic and forceful, without making her seem like a caricature? In truth it was very hard. She was my hardest character to work with. I was very angry at the way I had been raised and the way I saw children in strict religious homes being raised and I wanted to make the Mom very mean. But I worked on Converting Kate while I was getting my MFA at Vermont College, and one of my mentors, Adam Rapp, worked and worked with me, to give the Mom some sympathetic traits. And by the time I was done finding ways in which to make her more sympathetic, I found my own anger towards women who were raising their children like Kate was being raised, was diminished. I had more empathy for them. So it really was a great growing experience for me. You should have seen Mom the first draft. Wicked, mean, heartless! What were you doing when you got the call that Converting Kate was going to be published? How did you celebrate? I was in my home in Virginia. The first manuscript I wrote was also being shopped by my agent at the time, and to be honest, I cried because it wasn’t the other book. I am doing a major rewrite on that novel right now and because it is very close to my heart and my own life it is harder to achieve the right distance. Not that Kate isn’t close to me, or based on my own emotional experience. But this other book is different, and harder for me to write. My husband pointed out that I would probably have a much easier time trying to sell my other book, now that I had a publishing contract. And I realized he was right, and I realized all at once--oh my gosh--someone, Viking, a really good publisher, bought my book! And then the reality began to set in and I was so happy. I started emailing everyone I knew who wasn’t from my past and wouldn’t hate me for writing about growing up in a strict religion! I’m not exactly the pride of my former community and heritage for what I have done. But I am lucky to have many dear people in my life who were very happy and proud for me. What’s something writing Converting Kate taught you? I have learned so much from writing this book, but probably most important is to write from your heart and not worry about whether or not a book has sale potential. When I wrote the first draft of Converting Kate I was warned by published authors I trusted that books about religion probably would not sell to the teen market. But I felt so strongly about writing this, that I went ahead. What do you hope teens take away from your book? If my readers could take away a feeling of hope, a sense that life has options and the courage to follow their own spiritual path, regardless of whether their parents approve or not—I would be very happy. I love the fishing trips that Kate takes. Did you do any research for those parts? Yes. I went on lobster boats, interviewed lobster workers (trying to be PC here even though they are all called lobstermen in Maine) and wrote one lobster worker several emails. I hope I did enough. But it was fun and I learned a lot. For writers tackling often controversial topics, do you have any advice? I would tell writers who dare to consider tackling controversial topics to do it. Go forth with heart and passion and trust that there will be readers out there who want to read what they have to say. I have received the most rewarding emails from teens and adults who say they know exactly how Kate felt because that was like their own journey. So Many! I have three novels duking it out in my head right now, all trying to take center stage. I wrote Converting Kate and the other novel I have not sold at the same time and it seems to work well for me, to work on more than one project at a time. Two of the three I am working on now are also tackling somewhat controversial topics and the other, is a lark, so fun, it makes me laugh as I write it or even think about it. It is about a 14 year old girl who time travels back to the year 1850 in Wales. I spent my whole advance from Converting Kate to spend a month on the coast of Wales and had the most lovely time doing research for this novel. Hi, my name is Beckie Weinheimer. 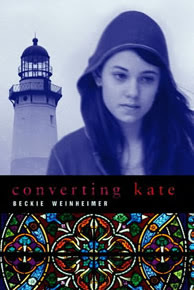 My first YA novel, CONVERTING KATE, Viking Books, 2007 is about a sophomore girl named Kate Anderson who is trying to figure out the difference between faith and religion, find peace with the death of her non-believing father, figure out guys, learn how to deal with public school, (she's been home-schooled) and a lot of other things. I was raised in a really conservative religious background and this inspired my story. But Kate is fiction, the church she grew up in The Church of the Holy Divine is fiction. I have lived in Utah, Arizona, Indiana, Ohio, Pennsylvania, Kentucky, California, Virginia and now I live in Queens New York in a high rise. I love it. I live near a park so I go walking and listen to books on my MP3 player. I love reading more than I love writing, but I think reading/listening to so many book helps me be a better writer. I have two adult daughters who are really cool and pretty and smart (because they take after their dad--ha ha!). Seriously I do love my husband, who wouldn't love a guy who left his church over you and got up at five a.m. every morning so he could edit CONVERTING KATE. He's my hero! I love to do email and love to hear from my readers good or bad reviews. It means a lot to me. I also love to encourage other writers no matter their age. My favorite word is inclusion. The word I hate the most is exclusion! I want us to be all one big happy earth family. Okay, I'll admit, I'm a total optimist and idealist. But I have fun in my little bubble of hope! All right! Beckie is giving away 2 signed copies of Converting Kate! This is a special giveaway because the deadline to enter has been extended to Monday, February 11 at 9pm. The winners will be announced on Tuesday morning. Leave a comment here, on LJ or in both spots to be entered. Ooh, great interview. And the book sounds really good! that was a really great interview, and the books sounds really interesting. beckie sounds like an awesome person. it is great that she has a postive outlook even though she's been through losing a child, i can't even imagine. i would love to win a copy of her book. I have been wanting to read this book, it looks great! Enjoyed the interview and would loke to be in the drawing! Wonderful interview, it sounds like a great book! Loved the interview. The book sounds absolutley amazing so count me in for a chance to win one of the copies!! Wow! Looks like a great read! Please enter me in the contest. Great interview. It sounds like an awesome book!